Thousands of cities in the developing world face rising pressures on water provision due to population growth and urbanization, and climate change worsens these impacts. Coordinating the formal and informal water sectors, improving water storage and management, and bringing community voices into water planning are critical to sustainably providing water, especially for the urban poor who are most vulnerable to water scarcity. 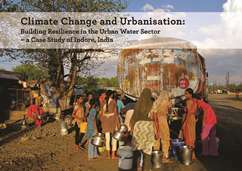 A new report, Climate Change and Urbanisation: Building Resilience in the Urban Water Sector – a Case Study of Indore, India, from the Pacific Institute, the Institute for Environmental Transition (ISET), and TARU Leading Edge provides detailed analysis of the water situation in Indore, India and shows a way forward to a more secure water future for developing country cities. While in developed country cities, the government or formal sector often exclusively manage water supply services, in developing countries other informal ‘water managers’ also become important. In these cities, thousands of people rely on self-supply, directly accessing the water source itself through private boreholes, or they obtain water through the private water market, where water vendors supply water through water tankers and treated drinking water. In Indore, like most developing country cities, the urban poor have limited access on all three fronts: the formal system is unavailable to them, private markets are unaffordable, and self-supply is not an option because they are landless. – improve connections among all stakeholders in the sector.